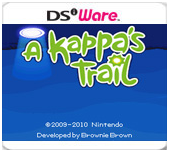 The logo of A Kappa's Trail. Use the stylus to successfully guide a kappa down the Kappa Trail, collecting items and avoiding obstacles as you go. Step into the world of a kappa, a mythical river spirit famous in Japanese folklore, as he tries to make his way to the human world. In addition to the challenging main game, you’ll find three different minigames to further improve your kappa-related skills. You’ll start your journey in Kappa Cove, a good place to go exploring, practice getting around, and munch on a few fish. The intuitive controls are all handled with the stylus (draw a trail and the kappa will follow it), but the helpful Chumfish is more than willing to teach you the basics. Once you begin your path down the Kappa Trail, you’ll encounter coins to collect, boulders to shatter, various mini kappas that can help in specific ways, and more. Just make sure that you avoid the Devil Hand, OK? And if you need a break, you can collect paintings or cassettes from the Chumfish Shack, count plates at a sushi restaurant, or test your mettle in the treacherous Trial of Tiles. With its cute graphics and charming story, your time with the kappa will certainly be memorable. Who knows what you’ll find as you make your way through A Kappa’s Trail?